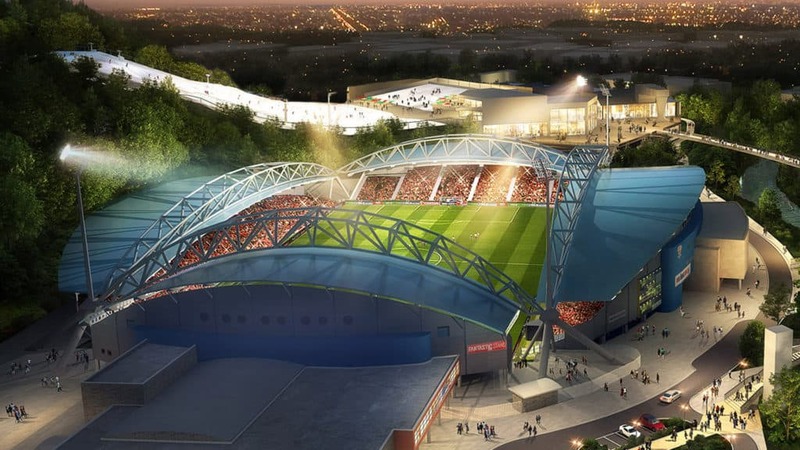 Kirklees Stadium Development Limited (KSDL), operator of the John Smith’s Stadium, has maintained that an ambitious £100m (€115.9m/$131.2m) development that would include the addition of a ski slope adjacent to the Huddersfield venue is still on, despite lengthy delays. The HD One snow sports and leisure project at the home of English Premier League football club Huddersfield Town and Super League rugby league team Huddersfield Giants was first unveiled over a decade ago. Along with the ski facilities, the masterplan is due to include a Radisson hotel, restaurants and other leisure facilities. Work was due to commence at the end of the 2017-18 football season, but the project has been hit with financial difficulties and while KSDL managing director Gareth Davies has conceded that the close of the current 2018-19 campaign will also fail to see development begin, he maintains work is still progressing on the scheme. Davies told local newspaper the Examiner: “Twenty five years ago people said the stadium wouldn’t be built and it was. It’s had six further phases of development since then. HD One has been delayed but that’s mainly due to the national economy. “Realistically nothing is going to start on the ground imminently at the end of the season as we hoped – but HD One hasn’t gone away. Very detailed conversations and work has been going on in the background, and it’s picked up pace in the last couple of months.